The clarinet came about around 1700. The exact date seems to be uncertain, but Johann Christoph Denner is credited with the “creation” of the clarinet by the addition of the register key to an instrument that already existed. That instrument was a simple, single-reed pipe instrument called the chalumeau. The chalumeau played lower notes and it varied in size somewhat. It had a very limited range and only two keys. It was much like a recorder, but used a single reed mouthpiece that is similar to the modern clarinet mouthpiece. 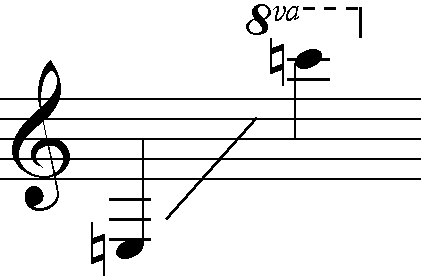 The lower register of the clarinet from the lowest E to the Bb throat tone (third line Bb) is considered the chalumeau register of the clarinet. When Denner added the register key (he actually modified an existing key), it enabled the chalumeau to play higher notes, which resulted in the clarion register. It is believed that the name “clarinet” came from the term clarinetto, which means “little trumpet” (which I’m slightly offended by for some reason) because of the high notes and somewhat shrill quality of the clarion register. The Clarion register goes from middle line B up to the second leger line C (thumb C), which is two octaves above middle C.
Over the course of the 18th century, the clarinet struggled for recognition, all the while being modified with the addition of keys. It was the youngest woodwind at the time (the saxophone had yet to be created) and still in the development stages. It did, however, catch up to the other woodwinds rather quickly, finding its place in chamber and solo music and also in the woodwind section of the orchestra. During this time, the altissimo range was explored. The altissimo range begins at C# on the second leger line, or right above the thumb C and extends up as high as the player is able. Practical written altissimo goes only to the fourth octave C, but there are other notes above that (if you dare). The clarion register has a brighter tone. The altissimo register has the brightest tone, which can be shrill. The technical demands of the music insisted that the clarinet move along in its evolution, so it quickly moved from 3 keys to 6 keys to 13 keys, then to the 17 (or 18) that exist on the Boehm system clarinet today. All this happened in the course of about 100 years! By the time Beethoven was hot on the scene in the early 1800s, the clarinet had already made its mark and was fast becoming a popular instrument. An interesting fact is that the clarinet was originally played with the mouthpiece upside-down from how we play it today. Yep. The reed was on top under the upper lip. Ever tried that? Yeah. Not too easy. Someone got the idea to turn it over (probably in the same curious manner that made you revert yours back to the “old” way) and try it with the reed on the lower lip and resting the teeth on the hard mouthpiece. And we’re off! The clarinet could now stand its ground and make some progress. All clarinets, no matter the size, have the same playable range. This is the range in which we read, and luckily, clarinet music is rarely written in bass clef, so it makes it much easier for us to explore the family! Albeit, they do not all have the same tone qualities in those ranges, but that’s why the clarinet family is so awesome. Don’t argue with this fact of range. If the clarinet is of top quality, you’d be surprised at the high notes you can play on the low clarinets! Some of the low clarinets are equipped to play even lower: many of them can play down to the low C below the E.
The clarinet family is the largest instrument family, containing 14 different sizes that I am aware of, and even more members if you count its cousins, including the taragatos and saxonette. A cool video demonstrating the clarinets from lowest to highest (minus the Bb Subcontrabass) and all three registers from altissimo down to the chalumeau is located HERE. The most commonly used sizes are the Bb, A, and Eb sopranos, Bb Bass Clarinet, Eb Contraalto, and Bb contrabass. The other sizes are used occasionally and I have had the pleasure of playing nearly every clarinet on this list; I have yet to play on the subcontras and a basset clarinet. Which ever clarinet you play, the references of the registers remain the same. Always strive to get that characteristic sound no matter the size. No other instrument family has so many options. As always, practice with patience and perseverance! Hey this is such a good content on clarinet. I do not know much about this instrument but I do have a background on music. I know that they play this instrument in college band. Also I have heard couple of Mozart’s clarinet concertos. What type of music do you play? Do you play classical? To my knowledge, Mozart wrote only one clarinet concerto, but I do wish he had written more. I am classically trained primarily, but I like to work on basically anything I can get my hands on. There are a few modern pieces that I absolutely love, Klezmer is a favorite (though I’m not great at it), and I also enjoy playing a little jazz. I recently performed the first movement of the Concerto No. 1 in f minor by Carl Maria Von Weber. I plan to put it on my YouTube channel as soon as I get a copy of the recording. What a very fascinating article about the history of the Clarinet! I didn’t know at all that the Clarinet was made from other instruments. I have never heard about the Chalumeau, Clarion and Altissimo. If I am right the Chalumeau is the oldest instrument and the Clarinet is the “newest” instrument. I also found it fascinating that each of the different instruments has different tones, from darkest to brightest. I’m glad you enjoyed my light version of the clarinet’s history. There is so much more to the story, but that’s maybe for another day! And yes, you are correct about the old and new. I will be discussing the different sizes of clarinets in a future post, hopefully complete with a video link of my clarinet choir!